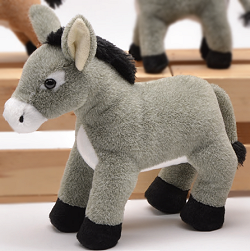 This adorable plush gray donkey stands tall and proud and looks forward to being adopted into your home. With soft gray fur, white accents (including tummy, muzzle, eye patches, and inner ears), black hooves, and fluffy black mane and tail tuft, this donkey stuffed animal makes a wonderful pet. Happy whether cuddling or adventuring, this sweet stuffed donkey cannot wait to share imaginative adventures with you. Fun Facts about Donkeys: Did you know that the offspring of a male donkey and a female horse is called a mule, but the offspring of a male horse and a female donkey is called a hinny? This cute little stuffed donkey has soft gray fur, white accents, black hooves, and fluffy black mane and tail tuft.